Louis National Crakow (born 1872) was the son of Hiram L. Crakow (1843-1897), a dealer in "fancy goods," gentlemen's furnishings and hats from around 1867 until his death in 1897. The family appears in the US Census of 1880 living at 160 Bowery (the gent's furnishings business was at this address from around 1871 until the mid-1890s). Louis is recorded as 7 years old at the time. Living with him was his older brother, David Sylvan Crakow, age 10. Both boys appear again in the 1900 US Census living with their widowed mother, Emma R. Crakow, on East 116th St., Manhattan. David Crakow's occupation is listed as Real Estate, while Louis N.'s is "Musical Novelties." David Crakow was in the real estate business in New York from around 1894 to the early 1940s, while L. National Crakow & Co., Advertising seems to have been Louis N. Crakow's first business (appears in listings from 1901 through 1904). Louis seems to have continued in the advertising novelties business until around 1915 when he and his wife, Hattie L. Crakow, began a children's and ladies' wear manufacturing firm at 1265 Broadway. It was this business that relocated to 119 W. 25th St. in 1920, where they stayed until 1924. 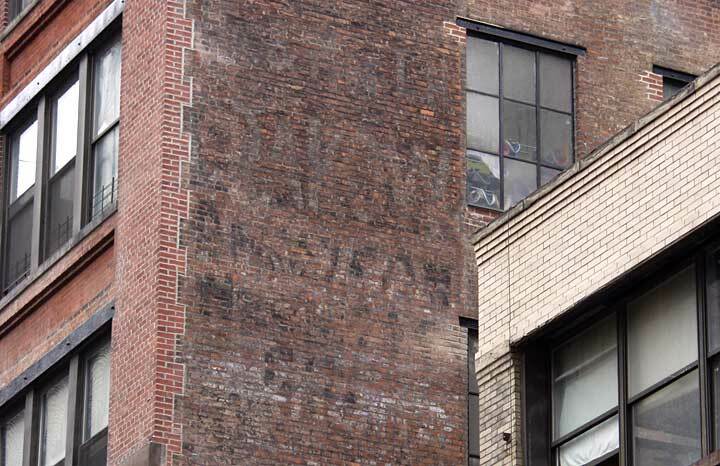 In the early-1930s a new manifestation of Mr. & Mrs. L. N. Crakow, called The Truth Shop (Ladies' Furnishings) opened on Lexington Ave. near 78th St.
Also on this wall several feet above Crakow one can make out "& Co. / Caps". (Click for image.) The line above would have read "Fox Lederer." Fox, Lederer & Co. consisted, mostly, of Henry Charles Fox (born Conn., 1878) and William Lederer (born New York, 1872). William Lederer inherited the caps & hats business from his father, Bernhard Lederer (born germany, 34 in the US census of 1880 when William was 8). B. Lederer & Co. at 38 Wooster St. in 1885 became B. Lederer & Son at 11 Bond St. around 1892. This ad for B. Lederer & Son appeared in the journal, The American Hatter, March 1900, when the Lederers were located on Greene St. Meanwhile, contemporaneous with B. Lederer was David Fox (born Germany 1851, immigrated 1865) with his own caps & hats business from around 1884 until joining with Bernard and William Lederer around 1901 to create the original Fox, Lederer & Co. at 5-11 W. 4th St. Henry C. Fox seems to have joined the company around 1906. About a year later David Fox is no longer listed as a member of the firm, and then about a year after that (by around 1908) Bernhard Lederer leaves (he appears in the US Census of 1910, a widower, age 64, giving his occupation as "none"). From this point forward it is Henry C. Fox and William Lederer who make up Fox, Lederer & Co., which continued in business until around 1940. They were located at 119 W. 25th St. from 1906 to 1920. In 1921 they moved downtown (a direction almost unheard-of in New York business re-locations!) to 15 Waverly Place. During the last 10 years of their life Fox, Lederer became a dealer in woolen goods instead of caps and hats (William Lederer, now 57, gave his occupation in the 1930 US Census as "Jobber / Wholesale Woolens," and Henry C. Fox gave his as "President, Clothing Co."